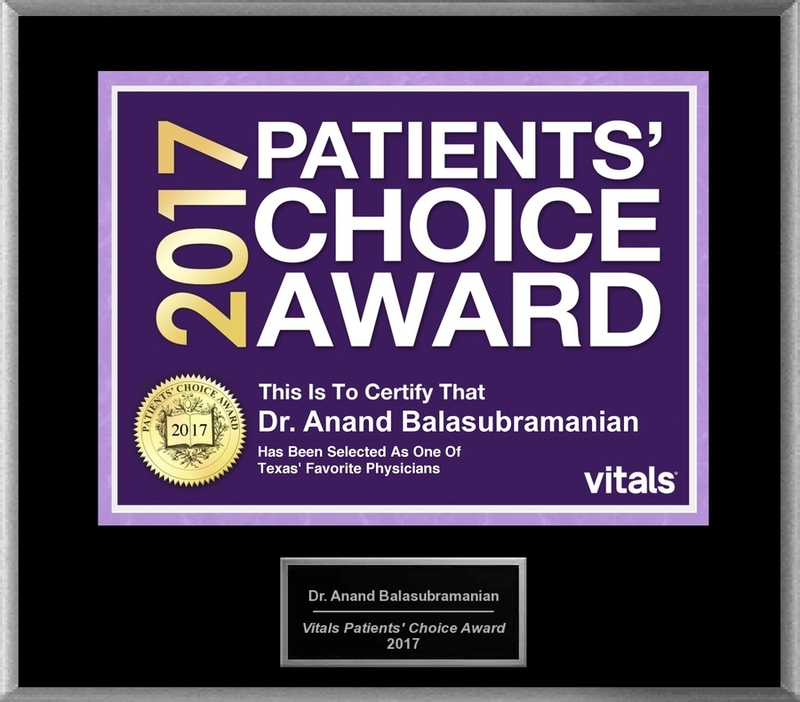 A select few of physicians were honored with the prestigious 2017 Patients’ Choice Award, and this year includes Dr. Anand Balasubramanian. HOUSTON, TX, October 27, 2018 /24-7PressRelease/ — Only doctors who received top ratings and reviews by their patients are awarded Vitals Patients’ Choice Award. With over 8 million ratings and reviews, Vitals has the largest collection of crowd-sourced data on doctors online. While other quality metrics are important to consider, patient ratings and reviews help identify doctors committed to providing skilled and compassionate care. Those are qualities that can’t be overlooked: a strong doctor-patient relationship leads to better compliance with care regimes which impacts patient health. Vitals Patients’ Choice winners are chosen based on the number and overall rating a doctor receives from patients for the calendar year. The algorithm also takes into account other quality metrics that the provider must meet. All told, only 7 percent of doctors were eligible for a Vitals Patients’ Choice award this award season. Vitals empowers everyone to shop for their health care like an expert. We bring together cost and quality transparency along with innovative consumer engagement programs to help people select high-quality, lower-cost care. Vitals leads the market with incentive and engagement programs that pay people to shop. Our solutions achieve measurable and sustainable savings for consumers, employers and health plans. Vitals helps more than 120 million people each year access better, more affordable care.